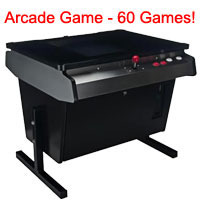 Challenge your guests to BATTLE IT OUT on our classic Arcade Game with 60 Classic games to choose from! Loaded with PacMan, Donkey Kong, Galaga, Space Invaders and other pre-installed timeless games, the Arcade Table is a modern take on an old classic. It will entertain and stimulate your co-workers, impress your friends, appease your kids and even bring out your own inner child on occasion.